Official government temperature graphs used to show no net warming from 1870 to 1970, and about 0.5C cooling from 1940 to 1970. NASA/NOAA have been steadily wiping this post-1940 cooling out, and now have completely erased it. They accomplished by changing the stations that were being used. Between 1940 and 1970, the average latitude of GHCN/GSN stations with daily temperature data linearly moved more than 20 degrees closer to the equator. This introduces a huge warming bias and allowed them to commit the biggest scientific fraud in history. In 1940, the set of GSN daily stations was heavily dominated by Russia, with almost no stations in Asia, Africa, Canada, South America, Antarctica, Middle East, China or Greenland, and few in the US, Australia or Europe. 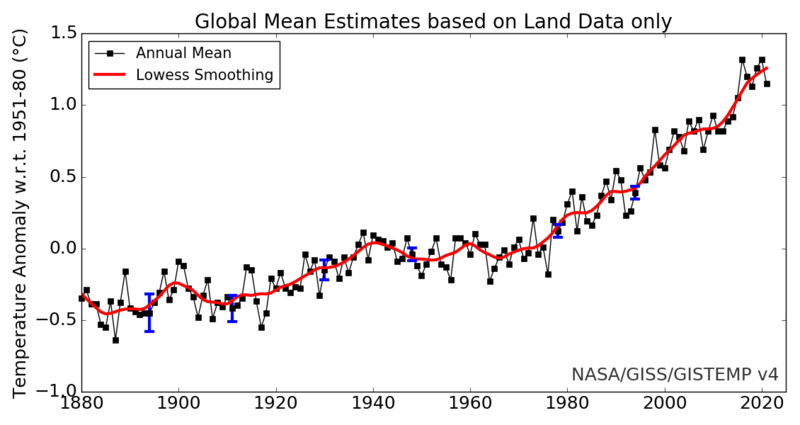 The temperature record from NOAA/NASA is a complete farce. I would like your opinion on whether a career in “rocket science” is a good idea. My son loves space and the technology, I wonder if it will never get back to even the “golden” age of Apollo? Is that a dead end for science? This article answers the question why. This one tracks the history. Very interesting as always! One question, though, if temperature stations in 1940s were dominated by Russia, was there a cooling bias in the data? (Not that 40s were very cool) If such bias did exist, couldn’t that cause the 40s to become ‘warmer’ if temps had been recorded at today’s larger number of lower latitude stations? Sorry if this seems like a dumb question. I don’t know how you keep all this stuff in your head but am glad that you do. and the articles at DiggingInTheClay around the same time period such as Canada – Top of the Hockey League (Part 1) which shows how droping the northern most Canadian stations changed the temperature record. E.M. Smith at ChiefIO also worked on the station dropout problem. Didn’t mean to say “extrapolated”. I meant interpolated, but interpolated from what? “…interpolated from what?” — The hole in their rears! Makes it much more toxic to humans than bovine feces. They’re total hacks. Fake science. That has been known for quite a while. Thing is, even realist scientists still use it. Why ???? I get very skeptical when someone matches something to GISS/NOAA or any of the related tribe of surface data sets. If you are matching them.. you are doing something WRONG !! It’s kind of like Valerie Jarret remarking on flowering trees in early March after having moved from Chicago to Washington DC. Why would NASA call their anomalies “estimates”? Are they not sure? Are they guessing the temperature? None of their other graphs seems to be “estimates”.